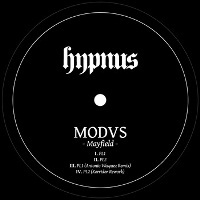 Modvs’ Mayfield EP is the inaugural release on Swedish deep techno artist Ntogn’s new digital & vinyl label, Hypnus Records. The release fits in on the darker edge of a wave of Nordic techno that favors deep and atmospheric textures, with such producers as Abdulla Rashim and Acronym leading the charge. The EP opens with “PL1”, in which the producer layers a low, throbbing kick beat below swirling, tunneling wind. The ambience is punctured by crystalline drops and off-kilter hi hats rising from the depths. The kick sinks into the drone in the beatless section in the middle, then reemerges to close out the track. While “PL1” accomplishes the dark, brooding feeling it aims for, it suffers from a lack of dynamism and motion. The sonic palette doesn’t vary much, and the second half of the track is mostly a rehash of the first. Antonio Vasquez’s remix of “PL1” is an exercise in introspective, tripping minimalism. Chopping kicks cut through the darkness, followed by tails of delay and reverb. The swelling wind noises from the original become even more pronounced in the remix, while subtle hi hats punctuate the rhythm. The track sounds like a primitive human sacrifice ritual being performed deep inside a lost cavern. The same deep, ambient wind sounds shape the atmosphere of “PL2”, but the round, 4-on-the-floor kick rhythm is accented by a nice shaker sound on the off-kick 8th notes, branching out into 16ths as the first section develops. The wind swells to the foreground during the middle section while the kick drops out, then recedes as the beat returns with a crackling swirl of claps. A subtle wood block with syncopated accents completes the rhythm. The sonic principles are largely the same as “PL1”, but the additional rhythmic elements add up to a nicely rounded track that sounds like a more ambient take on Deepbass’ atmospheric techno. Korridor (who will soon release his very own EP on Hypnus), turns PL2 into a noisy broken-beat monstrosity that is reminiscent of Dino Sabatini’s aggressively tribal works. The heavy low end is punctuated by a submarine sonar sound that pings out of the darkness, while eroded hats shake out 16th notes above. This track is sure to be the DJ’s choice, being the most exciting and rhythmically interesting track of the EP. “Mayfield EP” has some moments of excellence and some shortcomings. It would be nice to hear a bit more variation from Modvs, though his dark textural work is nicely done. Overall, the EP is a promising start to a new label. Keep an ear out for Hypnus’ output in over 2014!